Most people, even non-cannabis smokers, could pretty easily recognize two parts of the cannabis plant: the flower, or bud, that is dried and sold for consumption, and the fan shaped leaves that are often used in advertisements. 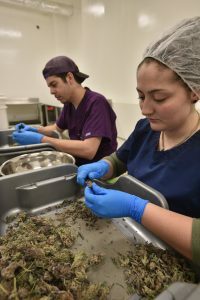 An important aspect of turning the flower of the cannabis plant into the dried bud that most people are familiar with is trimming. In order to get the bud to look how the consumer expects, cannabis growers need to trim the bud from the rest of the plant. While cannabis looks lush and leafy as it grows, cannabis connoisseurs strive generally try to sell buds that are trimmed down into a round or pointed shape. 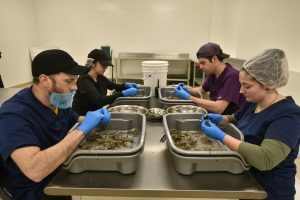 At INSA, a medical marijuana dispensary in Easthampton, hand trimming is part of what makes their product craft cannabis. Before the staff at INSA hand trim their bud, the cannabis plants need to be harvested and hung to dry. Conor Dunphy, the harvest manager at INSA, said that the plant hangs for about five days to dry out after it’s cut down. 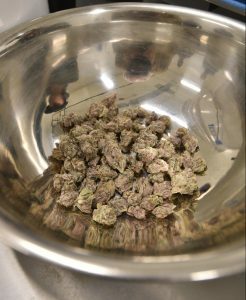 Once it’s dry, the cola of the plant, or the collection of buds that grow tightly together, are taken off of the bulkier stems and leaves and stored until they can be trimmed. Dunphy said that optimal storage humidity is key during this time to prevent mold and that the containers the buds get stored in need to be “burped” everyday to release moisture. Dunphy and his team then sort through the buds, ensuring that only the best make it through to be trimmed. The rest won’t be wasted: they’ll be used to make other products that INSA sells. “On any cola you’re going to get (buds) that weren’t able to get a lot of light and are far more suited for an edible product,” Dunphy said. All of INSA’s products are made in house so it’s easy to make sure no valuable product goes to waste. Once the cream of the crop is selected the buds are brought to the trimming room where Dunphy’s team trims each by hand. “Practice makes perfect, you just want to be super slow and meticulous,” Dunphy said. Unlike other big growers that might use a machine to trim their buds, all of INSA’s are trimmed by hand using small butterfly trimmers. Dunphy explained that the trimmers are spring loaded, to make trimming ergonomic for the staff, and that they are small to allow for a lot of precision cutting. Once they have the buds, the INSA staff cut off any excess stem or leaves, including sugar leaves, which are tiny leaves that look like they are covered in sugar. 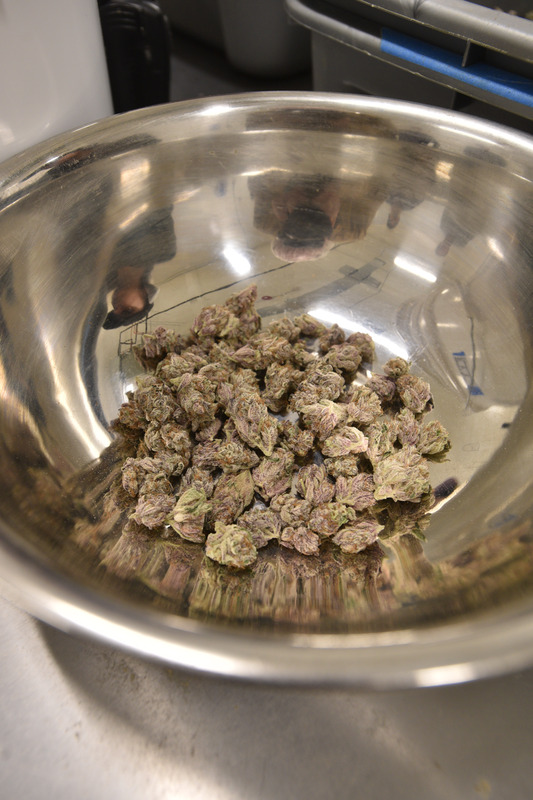 Dunphy said that smoking the leaves can be harsh and not tasty so they don’t include them among the buds that they sell directly to customers, but these leaves also go to good use and get ground up and used to make the cannabis oil distillate that INSA uses in many of its edible products. Once the trimming is done the finished buds get weighed and packed for sale in the dispensary. Zatyrka said that having a quality product is essential for their patients who are often connoisseurs themselves. “Not only do we want to have a good physical effect but a good visual as well,” Zatyrka said.